Allegro’s RomWebClient AE toolkit allows your engineering team to leverage proven Web technology when creating custom networked embedded designs. The RomWebClient AE toolkit enables embedded engineering teams to build products that send and receive objects to and from any Web server using HTTP with full support for IPv6 and dual mode IPv4/IPv6 operation. For secure communications, RomWebClient AE is tightly integrated with Allegro’s RomSTL TLS toolkit allowing your design team to make full use of TLS 1.2 with FIPS 140-2 and Suite B cryptography. By utilizing RomWebClient AE technology your embedded device can communicate with Cloud-based resources, download configuration files, retrieve software updates, retrieve “print-by-reference” documents or send status notifications to a remote server. The RomWebClient AE toolkit enables your embedded device to fully support HTTP 1.1 for sending and receiving HTTP objects in any format with any Web server. MIME definitions for all standard MIME object types are provided in addition to allowing support for non-standard MIME types. 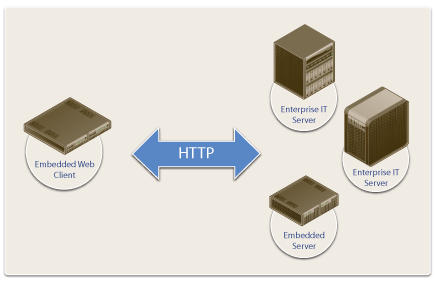 HTTP objects can be sent or received from memory or an optional file system. Both HTTP direct requests and proxy server requests are supported. For authentication, HTTP Basic and Digest methods are provided and are compliant with RFC 2617. The RomWebClient AE toolkit also has built-in support for advanced caching, pipelined requests, proxy authentication, large object data streaming, and HTTP cookies. Delivered as ANSI-C source code the toolkit is built upon a highly portable and field-proven abstraction layer enabling it to work with any OS or TCP/IP stack. The RomWebClient AE toolkit is pre-integrated with Allegro’s RomXML and RomXOAP toolkits allowing manufacturers to easily built advanced device management architectures that require XML and SOAP-based communications with Cloud-based resources. The RomWebClient AE toolkit includes support for integrated retrieval and transmission of XML objects when used in conjunction with the RomXML AE and RomXOAP AE toolkits. This allows your design team to create devices that initiate XML-based request/response protocols such as the Simple Object Access Protocol (SOAP) making them easier to integrate with enterprise information systems. Security is always a concern when dealing with devices connected to the internet. RomSTL addresses the need for advanced security with integrated TLS 1.2 support. With support for a variety of cipher suites (RSA, DHE, RC4, DES, 3DES, AES, SHA, CBC, and MD5) and full integration with Allegro’s FIPS 140-2 validated cryptography and Suite B, your development team can provide compatibility with all standard secure browsers. RomSTL also provides Basic and Digest Authentication support under TLS. Compliant with IETF standards (RFC 5246 and RFC 3268), RomSTL provides RomWebClient AE with the advanced security functionality to meet your development team needs.